In practice we can see that jamón de bellota is only produced in Spain and Portugal, but this has not always been the case and perhaps it won’t be in the future either. Pigs are eating acorns in the forests bordering the Mediterranean Sea long before it was domesticated by humans. The oaks in drier region and the cork trees and oaks in wetter areas were very common until a couple of centuries ago. In Homer’s Odyssey, the goddess and sorceress Circe turned Ulysses’ companions into swine and fed them acorns, which suggests that in Ancient Greece pigs were fed on the fruit of the oak. 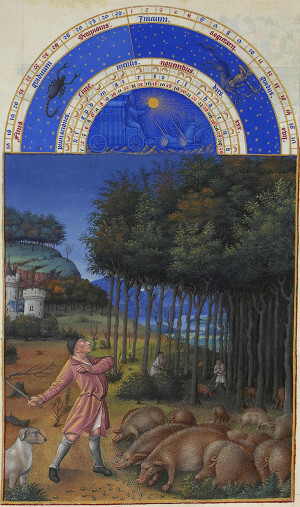 In the 15th century, a famous manuscript called “Très Riches Heures du Duc de Berry”, written in the central France, used a scene in which pigs are eating acorns in the forest (see the reproduction on the left) to illustrate the month of November. It’s a work by the painter Jean Colombre, dated between 1485 and 1486. Marco, a reader of this blog, informs us that currently in France there are small amounts of pigs that feed on acorns on the island of Corsica and the department of Hautes Pyrénées and bordering regions near the Aragon Pyrenees. Those in Corsica come from an autochthonous breed called Nustrale (or U Porcu Neru), a small and shaggy dark animal bred in freedom for nearly 2 years and also fed with chestnuts. In the Pyrenees there is the black pig Bigorre (of the Gasconne breed), which was on the brink of extinction in the late 20th century. Our Pata Negra also went through a similar time of uncertainty during the 1970s. Lower Franconia is a region in the state of Bavaria (Germany) where they have begun to recover the old ways of grazing pigs and feeding them acorns. What began as a pilot scheme in 2003 has become reality in the EICHELSCHWEIN® GmbH company (literally “Acorn Pigs, Inc.”). The German jamón de bellota with an 18 month curing period sells for €65/kg, in line with the cost of a Organic Iberian Bellota Ham from Jabugo. Italy is one of the largest cured ham producers, but according to Giovanni Ballarini, President of the Italian Academy of Cuisine in the 12th century they stopped feeding pigs with acorns and other fruits of the forest and began intensive breeding in stables. However, after seeing the success and acceptance of Spanish Iberico ham, various producers in southern Italy (Naples, Sicily) are reviving ancient indigenous breeds related to Iberian pigs. The most prominent example is the Prosciutto Crudo di Maiale Nero Siciliano Monti Nebrodi, made from pigs bred in freedom and fed with chestnut and acorns in mountainous pastures of northern Sicily. In Morocco, on the northern slopes of the Atlas, it’s also easy to find oaks and forest similar to Iberian pastures. The tree bark is used in making dyes for clothes (one of the main economic activities of the country) and acorns can be purchased in local markets for human consumption. Muslims do not eat pork and therefore there are no ham manufacturers there today, but if the demand for this product is still increasing we shouldn’t rule out that some producers will begin using this part of Africa to fatten their stock. Recently there has been several news stories concerning cured ham production in China and warned that the ham curing industry could suffer a similar relocation which has already taken place in other industries. It is no secret that Asians are jamón enthusiasts. They have learned the Spanish and Italian techniques and have begun to produce it from white pigs. In a recent article in La Vanguardia, a researcher at the University of Córdoba stated that soon they will begin to use Iberico pigs. It may not be good news for the producers of jamón de cebo (made from pigs fed with fodder), although right now production in China barely reaches 1% of that of Spain. Manufacturers of Iberian ham can rest easy, because playing such a complex ecosystem as the Mediterranean pasture is very difficult, although the Spanish entrepreneurs behind AcornSeekers claim to have achieved just that in Texas (USA), and expect to flood the American market with fresh meat and “Made in USA” Pata Negra hams. Author M. Nieto GallardoPosted on August 1, 2017 February 4, 2019 Categories Facts about pata negra ham, Iberico Ham in the word, Spanish ham productionLeave a comment on Is Bellota ham produced outside of the Iberian peninsula?